Introducing the new E-series slim frame design with an ultra-thin profile. The VIZIO 55” Class Razor LED™ Smart TV with Theater 3D® is shattering the mold in a way only VIZIO can, with high-quality design and picture at the best value. 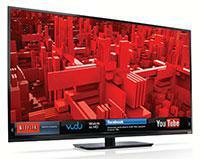 Enjoy crystal-clear action and eye-popping images in 1080p Full HD and 120Hz with Smooth Motion. A stunningly slim outer frame lets you enjoy TV with a narrower border around the picture for a more immersive experience.